In the newly introduced central pay commission which is the 7th CPC, the central govt. has set some guidelines regarding a special allowance named the night duty allowance for its employees. Those employees who will be engaged in performing govt. duty during night, i.e. apart from their regular duty hours, will get this special allowance. This allowance under the 7th pay commission will be applicable to employees of each and every department of central govt. like defence, railways, ordinance factories and other various units. The allowances for night duty are given according to the pay band of the employee. For every single night duty, this allowance is provided. 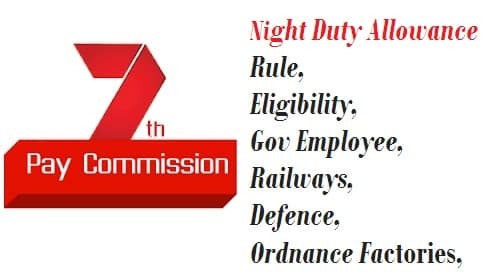 Currently the night duty allowance is following the 6th pay commission rates and till now no such review of the rates has been announced in 7th CPC. The Govt. has set some rules regarding the calculations of the night duty allowance for the employees of central govt. The working shift for night duty starts at 22:00 hrs and continues till 06:00 hrs of the next day. So when the employee works during these hours, they earn an extra bonus in form of night duty allowance. For every hour they work at night, they get an extra salary of 10 minutes. So during nights, the employee can work for a maximum of 7 hours, he / she will get extra salary of 70 minutes or 1 hour 10 minutes. One hour is for recess and the employee will not get any allowance for that. But as per the recommendations of the 7th pay commission, this rate has not been increased till now. All employees who are permanently posted in various departments of central govt. like railways, defence, ordinance factories, health centres, etc. are eligible for this special allowance for performing duty during 22:00 – 06:00 hrs. There is no night duty allowance for recess period. They get this allowance according to their pay band. The ordinance factories functions under the Ministry of Defence. The employees of these units also need to serve during night shifts. This means, those employees who work during the time interval of 22:00 – 06:00 hrs are eligible to get night duty allowance. The rate of each hour of night duty is the salary divided by 195. The salary includes the pay band, grade pay and the dearness allowance. Then an extra of salary for 10 minutes per night hour is added. The employees who work under the Ministry of defence also get the night duty allowances as per the 6th pay commission recommendations. In the new pay commission, to be implemented very soon, no such recommendations regarding revising the rates of the NDA are there. So the employees will get NDA calculated on the basis of their salary divided by 195. And an extra 10 minute per hour will be added. All central govt. employees are entitled to get this night duty allowance if they work in night shifts i.e. from 22:00 – 06:00 hours. This excludes an hour for recess period. The NDA per hour for the central govt. employees is calculated by dividing the salary by 200. This salary includes pay band, grade pay and DA. Then extra 10 minutes for each one hour is added. All employees of the civil defence also get the night duty allowance according to the prescribed rates by the govt. There is a calculation for the per hour night duty allowance for these defence employees. At first, their salary is divided by 195. This shows the charges of night duty per hour of the employee. Again an extra of 10 minutes for every night duty hour is added to this allowance.